A group of college kids having an overnight party in the mall is hunted down by malfunctioning security robots. "Chopping Mall" is a tongue-in-cheek 80's B-horror film directed by Jim Wynorski, who has an astounding 103 directing credits, including numerous adult films like "The Witches of Breastwick," and "The Bare Wench Project." He also took a little time to direct the family adventure movies "Nessie & Me," and "A Doggone Christmas." 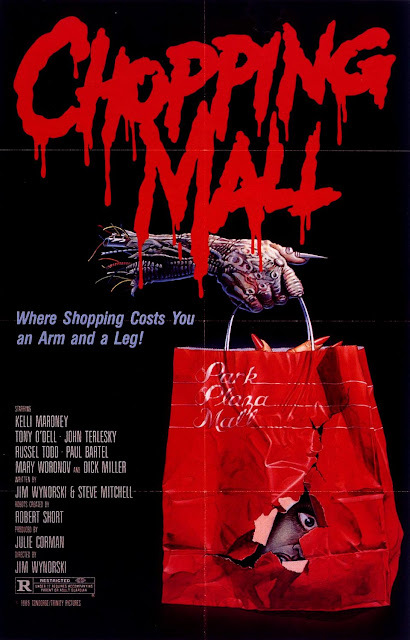 It stars Kelly Maroney, Tony O'Dell, Russell Todd, Karie Emerson, Barbara Crampton, Nick Segal, John Terlesky, and Suzee Slater, who play eight friends planning an after-hours party at their work inside of a mall. The mall, however, has a few new security bots who have become murdering robo-maniacs after a lightning storm. What could possibly be bad about murder robots killing college kids in a mall in the 80's? Nothing, absolutely nothing could be bad about it. OK, maybe the acting and the dialogue, but the overall experience is something great. This movie is cheese at its absolute best and it knows it early on. It takes a somewhat comedic approach to its horror subject. This movie is remarkably 80's, everything from the setting of a mall to the big hair, from the pastel-colored clothing to the fervent fear of technology and the amazing synth soundtrack. Despite the comedy early on, there is a lot of action and a few ultra-bloody deaths. One character gets their throat torn out while another gets their head exploded by a laser blast. One very brave young adult makes a heroic kamikaze charge at a murder-bot at an extremely low speed in an electric golf cart type vehicle. Many of these deaths are ridiculous but amazingly so. It's impressive how characters with the skills to build explosives and re-wire elevators work at a linen store. They must have interesting lives outside of work! When speaking about low-budget schlock horror films, you can't get much better than "Chopping Mall." It may not be a "good movie" in the traditional sense, but dammit, it is entertaining and pretty incredible despite its flaws.